This classic headboard will help create a soothing atmosphere after a long day. 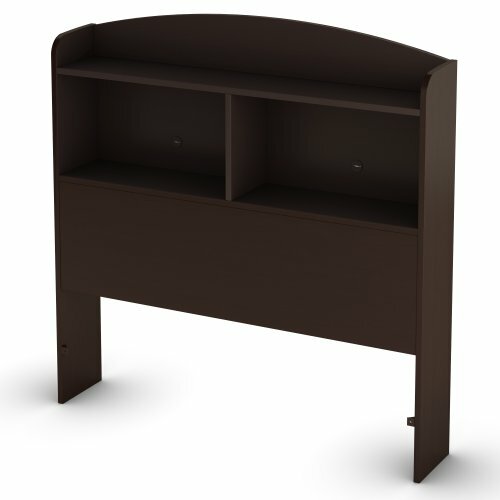 With its many easy to access open storage compartments, this bookcase headboard is perfect for fulfilling bedside storage needs, keeping your reading materials and personal items organized and close at hand when you need them. This classic bookcase headboard features practical open storage spaces separated by sturdy and reliable fixed shelves. It has a hole in the back panel allows cables to pass through for better wire management. The bookcase is easy to keep clean with a soft dry cloth. CLASSIC STYLE: This simple bookcase headboard blends style and functionality in a simple and elegant piece of bedroom furniture. ACCESSIBLE BEDSIDE STORAGE: Provides 2 open storage spaces and a top shelf within easy reach.